I won a Samsung Galaxy S6 Edge, signed into it with my Google account, played around with it, wiped it, and sold it. Now the person can't get past setup because it's saying he must login with an account previously synced to the phone. Is there anything I can do from my side to remove this lock? There are full guides for several devices from RootJunky on YouTube. This first method works on some Samsung and LG devices. Your user can probably start at step 4. Reboot into Recovery mode (hold Home, Volume Up, and Power, releasing Power when you see the device turn on/reboot). Perform a Factory Reset (press Volume Down until wipe data/factory reset is selected, press Power, scroll down to Yes -- delete all user data and press Power again). Proceed through the device Setup Wizard until it prompts you for the Google account credentials. For a Samsung device, save this RootJunky APK onto a USB flash drive, and connect it to the device via OTG. Back up, connect to Wi-Fi, then back up again and hit Accessibility (Yes to the prompt that follows). Turn "Switch Access" on, then enter its Settings and set a key for Overview, such as Volume Down. Press the key you set up for Overview, hit Dual Window, and select the file browser. When the File Explorer launches, browse to and tap the APK to install it. When you get the prompt about unknown sources, choose the Settings option and enable the Unknown Sources option. Complete the install and choose to Open the application, which will open Settings. Add a new user account under Users, switch to it and add your own Google account via Setup, then switch back to the main user (Owner) from Settings → Users, and back out from there to the main Settings. Go to Backup and Reset and do a Factory Data Reset. As per my other answer, this will remove FRP from the device. The APK in (4) is very simple and just opens Settings, you could use any other that does the same if you don't want to trust that source. Insert an activated SIM card and call it from another phone. Answer the call, hit the Add Line (call conferencing) button, and enter *#*#4646#*#* or *#*#4636#*#* (worked on Nexus 5X). Tap "Usage Statistics", then hit the back button, and you're in Settings and can do a factory reset. If Factory Reset is disabled thanks to a security patch, you can instead create a new user account (going through and setting it up), then follow the very next guide below for the Turbo, starting at the second paragraph. You can also do this without a sim through this exploit. Now you can go into Settings and do a Factory Reset. Navigate through the Setup Wizard to the Wi-Fi connection screen, and select a password-protected network. Select "Show password", then type in a password and select the password text. Hit "Share" in the menu that pops up and select Gmail. Add a POP or Exchange account (not a Gmail account), and (from the message pre-populated with the text you "shared") select Settings from the 3-dot menu and then choose "Manage accounts" from that same menu. You should now be in the Settings app. Follow the above Turbo guide starting at the second paragraph, and you're done! For devices where none of the above or similar methods work, or after these exploits are fixed, see my other answer. No, there is not (or there shouldn't be). Factory Reset Protection uses a protected storage area located at /dev/block/*/by-name/frp that can't be wiped without special privileges or initiating a Factory Reset from Settings. If the user was able to root the device they could manually launch Settings via adb and do the reset themselves, but rooting is typically not possible when you can't even get past the initial setup wizard. If your bootloader is unlocked and/or you've already rooted the device, however, they could overwrite that FRP partition in order to bypass it! If he sends the phone back to you: Log in with your Google account at the prompt in the Setup Wizard, finish the wizard, and then go to Settings and do the Factory Reset from there (rather than via recovery, etc.). See this Android Police post for more details on the feature: What Is Android 5.1's Anti-Theft "Device Protection" Feature And How Do I Use It? It worked beautifully on a OnePlus2 just two days ago: After calling *#812#** the phone unlocked and I was shown the home screen. After that I went to the setting and added a new Google account. Since then the phone works perfectly and thus is absolutely safe. If you have the same problem, just try it. If it unlocks, then good for you. If it does not, then just nothing happens. IF the phone has a Google keyboard, the following may look pretty lengthy but it doesn't require OTG cable or PC so it's worth a try. You will be prompted to enter email, then tap on it as if you want to type something to bring up keyboard. From the keyboard, tap and hold the “@” button until it pops up gear icon to input options like Google keyboard settings, languages. From the screen displayed, look for Settings in the text, select it, copy it and tap on the search icon. Connect your Wi-Fi again. You won’t be prompted to log in the previous Google Account and instead the phone will ask you to ADD a new Google Account. Instead Skip it. Continue to set up your phone. Reset the phone and power it back on. Choose your preferred language, then tap on Start. Connect the phone to a WiFi network (preferably your Home network). Skip several steps of the setup until you reach the Verify Account screen. Tap on the email field, in order to activate the keyboard. From the Settings menu within SwiftKey select Languages. Minimize the menu on the screen, then go to the Google search bar. When prompted to sign in with a Google Account, choose "No, Thanks". In the Google search bar, type Settings and select it. If the SwiftKey menu pops up again, tap on Got it, then Not Now. From the Settings menu select Backup and Reset. When you wiped your Samsung Galaxy s6 edge that you sold, the factory reset protection security feature was triggered. Luckily, it is possible to Google account bypass the phone. There are actually a few ways you are able to take your google account off of the device. • Preform the google account bypass on your own using a guided YouTube video is an extremely effective but tedious way to unlock your phone. A lot of youtubers have quality videos demonstrating the FRP unlocking process of your device. Sometimes these methods work sometimes they dont. •Find a remote FRP removal service that is able to google account bypass your phone from home on your computer. •There are many phone repair shops that offer a FRP removal service that will perform a google account bypass on your phone. I didn't realize that you posted the update until after I had already finished this post. You chose the second method! Good choice. I have also heard very good things about unlockjunky.com as a Frp removal service. Not the answer you're looking for? Browse other questions tagged factory-reset google-account frp or ask your own question. 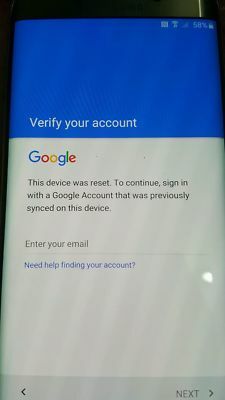 How do you bypass the google account on an RCA RCT6873W42 Android 6.0 tablet? How can i bypass Google verify account page on my infinix Smart Android phone?